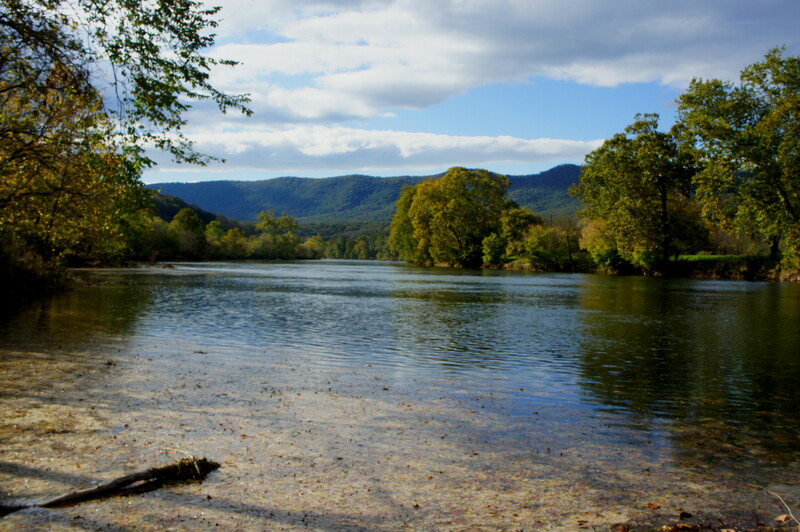 Situated in the heart of Shenandoah Valley, northern Virginia’s Shenandoah River State Park is an oft-forgotten destination in a heavily-trafficked area. 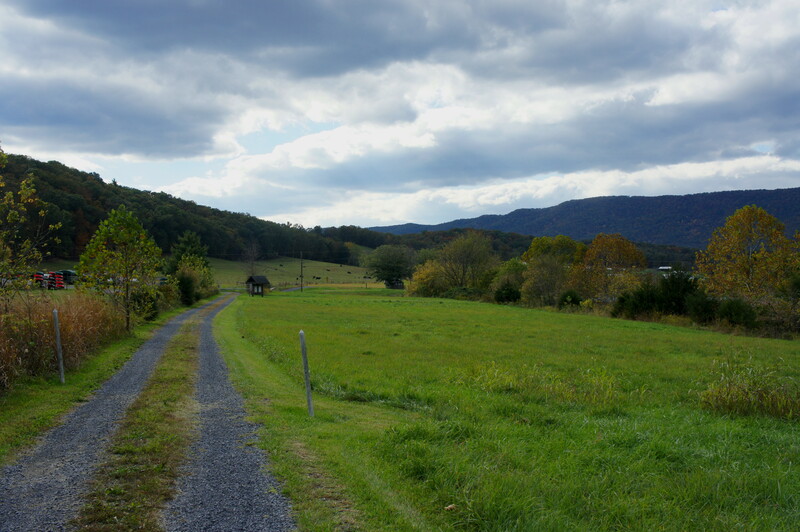 While lacking the heights of nearby Shenandoah National Park or Massanutten Mountain, a tangle of hiking and biking routes crisscross the state park, exploring fields and bluffs adjacent to the Shenandoah River, the waterway of “Take Me Home, Country Roads” lore. 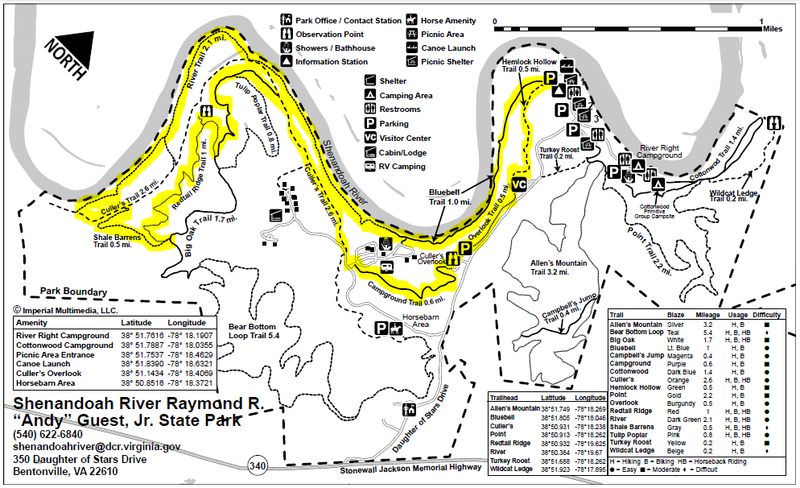 The park has more than 24 miles of trails, and the (somewhat complicated) loop outlined below offers a fine introduction to the diverse landscapes of the park. It covers 7.8 miles, nearly half of which is along the river. 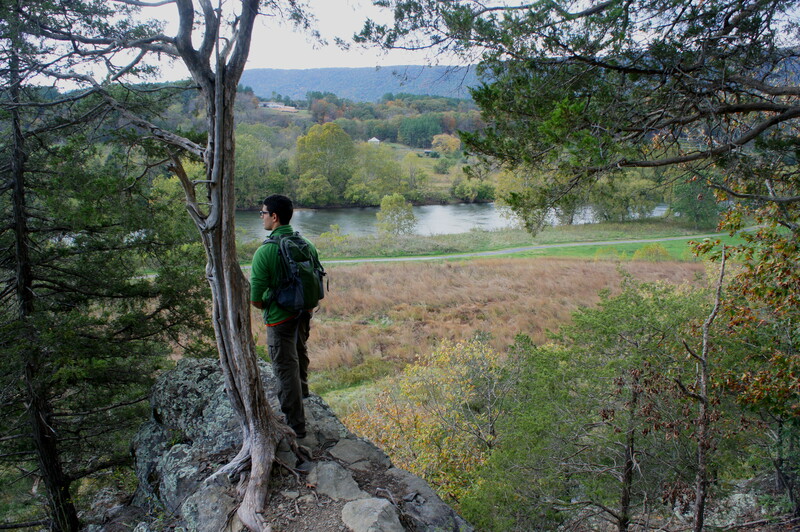 There are several places to begin this hike, but there is perhaps no better spot to start than at the Shenandoah River Visitor Center. To reach the center, drive 1.3 miles from the entrance on Daughter of Stars Drive, staying right at the only significant fork. The parking area is on the left. After checking out the beautiful glass-paneled Visitor Center, bear right onto the graveled path, which weaves westward behind and below the building. After only 50 yards, the trail splits—bear left onto the Overlook Trail (the magenta-hued option on the trail marker) to begin the 7.8 mile circuit. Start of the Shenandoah River circuit at the Visitor Center. The park has very good and prolific signage. 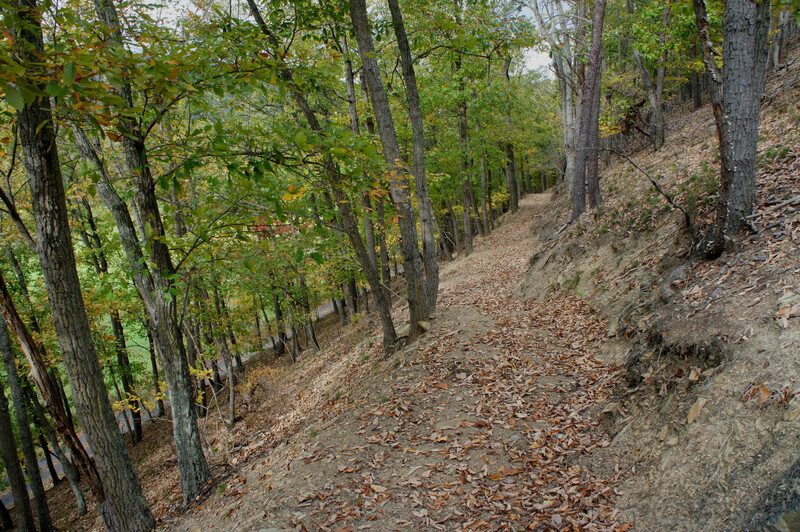 The Overlook Trail remains high up on the bluffs for ½ mile, at times flirting with Daughter of Stars Road above and to the left. Occasional window views offer a look down at the fields of Shenandoah Valley to the west. The trail is wide and relatively smooth but is chock-full of ups and downs. 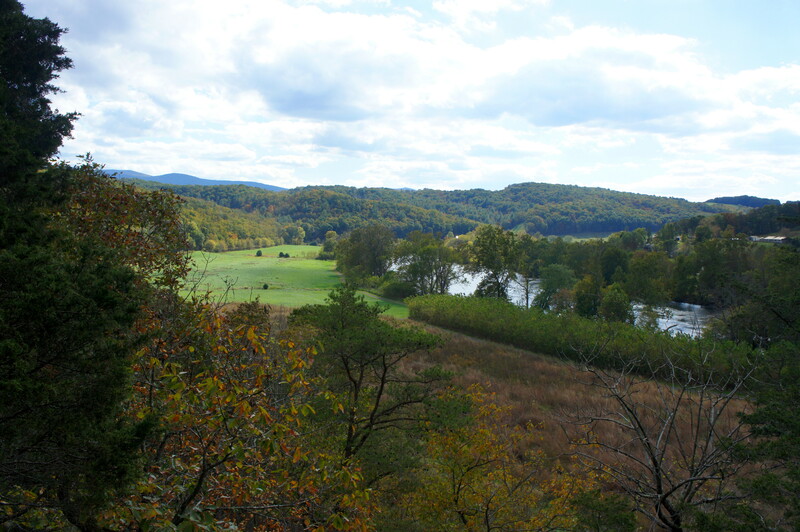 At ½ mile, an elevated porch appears on the left—this is Culler’s Overlook, which is best accessed by passing the overlook and turning left at the next junction, where a short path leads to the overlook parking area. 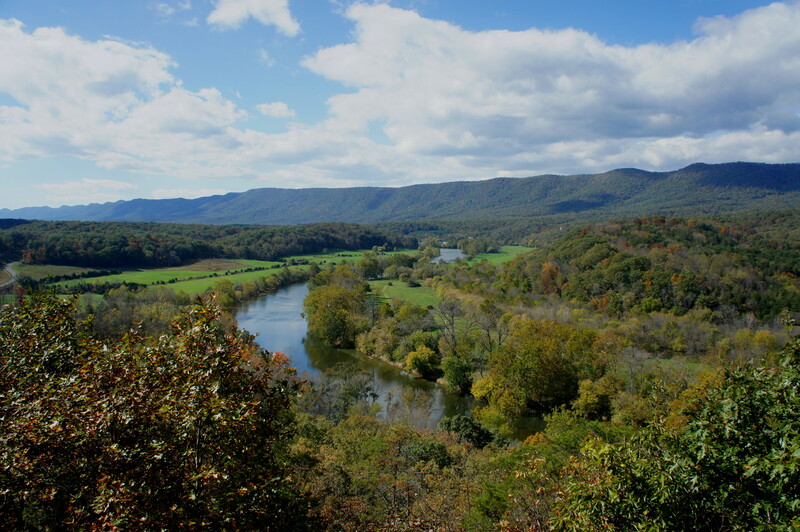 While the Overlook Trail itself offers partly obstructed views of the Shenandoah River, Culler’s Overlook rises above the trees to provide a beautiful panorama of the valley with Massanutten Mountain beyond. After visiting the overlook, make your way back to the trail junction and bear left (or right if you skipped the detour) onto the purple-shaded Campground Trail. As the name suggests, this trail leads 6/10 mile to one of the park’s several camping areas, this one usually reserved for small RVs. The trail spits out onto the paved road leading into the campground; bear left on the road, then immediately turn right onto the main drive. Follow this road for 50-100 yards to a point just before the road bends left; here you will find an “authorized vehicles only” sign. This is the start of the Culler’s Trail section, named for the family who once owned much of the land that has now become Shenandoah River State Park. Culler’s Trail is an old farm road, mostly graveled, that effectively parallels the river for 2.6 miles, though it keeps a good distance from the water. A grassy, well-trimmed field separates Culler’s from the more popular River Trail on the opposite side. 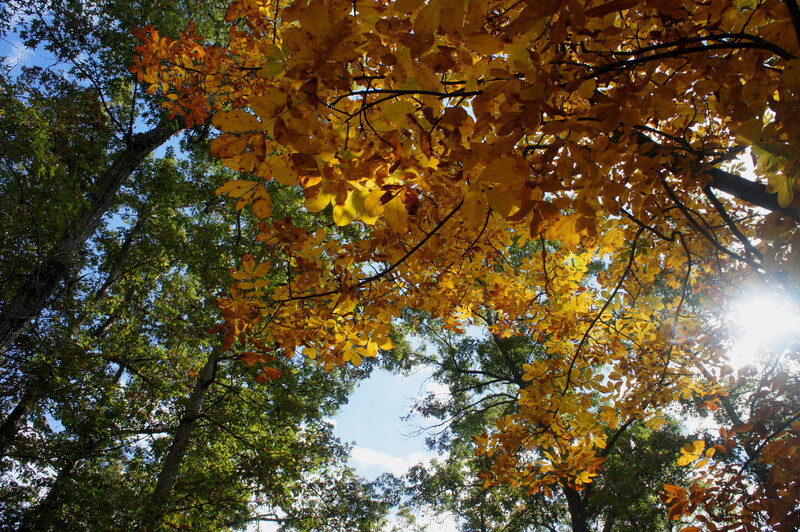 Unobstructed views of Massanutten Mountain to the north and west abound. 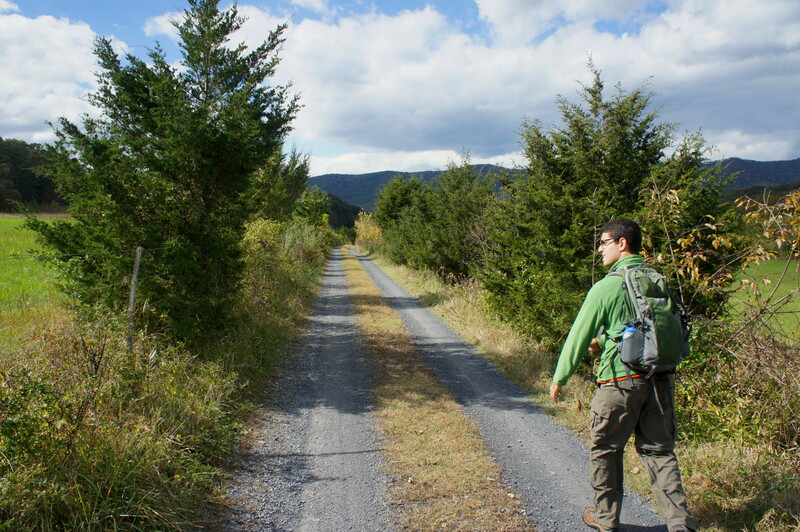 At a point 4/10 mile from the start of Culler’s, a spur trail veers off the left; stay straight on the main path. Eight-tenths of a mile from the campground, look for a trail sign on the left; here the Big Oak Trail begins to climb the hillside and meanders back into the woods. The Big Oak Trail is probably one of the less interesting routes in the park, but it provides access to the excellent Redtail Ridge Trail after about ¾ mile. 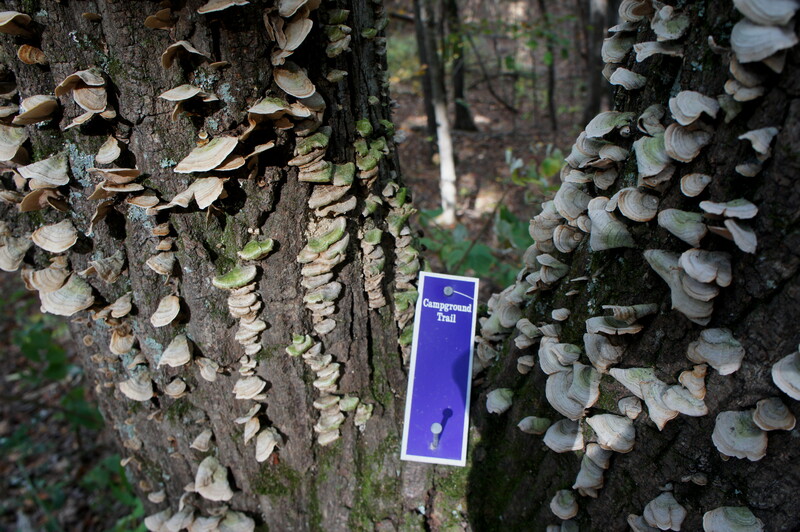 The highlight of the Redtail Ridge route is the “Scenic Observation Point,” situated on the precipice of a bluff overlooking the Shenandoah Valley. Both Blue Ridge and Massanutten Mountain are visible off to the south. 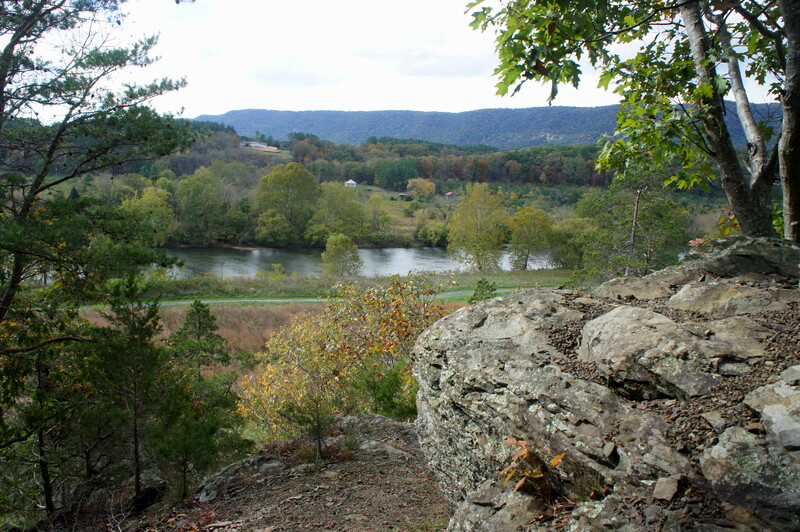 As are Culler’s Trail and the River Trail in the foreground below. This is a nice place to stop for a snack break before continuing on. The rest of the 1-mile Redtail Ridge Trail offers a couple more pleasant views of the valley, though none as rewarding as Observation Point. In lieu of cutting across ravines, the route generally winds around them, facilitating a gentle grade that I suppose is preferable for mountain bikers and horseback riders. Just over 3.5 miles from the Visitor Center, the Redtail Ridge Trail feeds into the gray-marked Shale Barrens Trail; bear right at the fork. Shale Barrens is probably the steepest of the circuit’s many sections, following a wooded gully down to the main valley, where it connects with the Culler’s Trail after ½ mile. Bear left on Culler’s and follow it 2/10 mile to the next junction. The park’s southern boundary lies just beyond—determined hikers can continue on Culler’s Trail for another 1/10 mile to its end (the Down River Canoe Company lies just beyond). 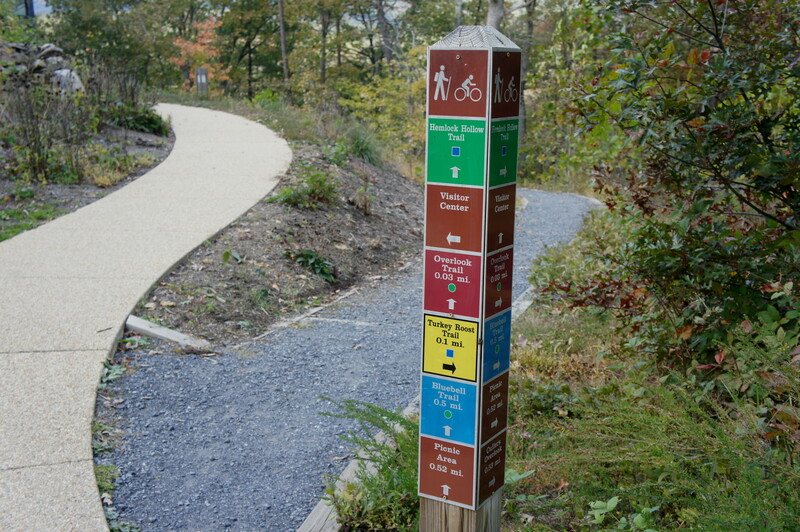 All others will want to turn left onto the River Trail, which quickly beelines for the Shenandoah’s eastern bank. 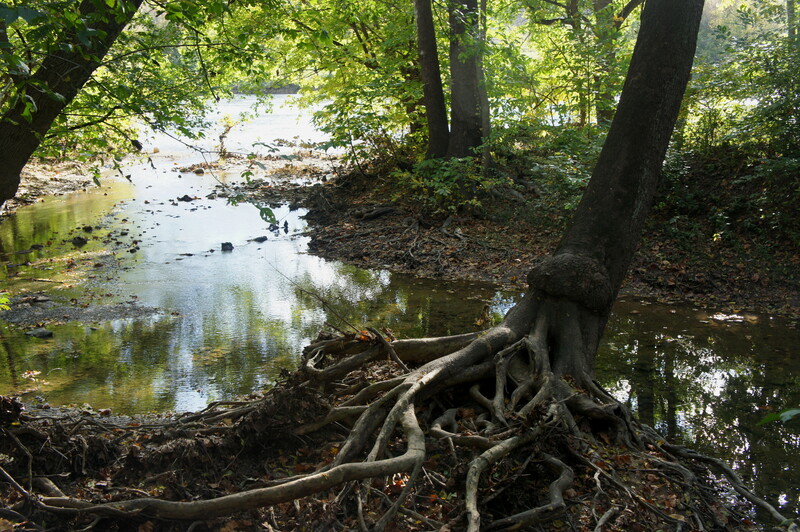 Much of the river is obscured by trees, but several river access points are interspersed along the 2-mile hike back toward the RV campground. Stay left at the first junction (1/2 mile from the start of the River Trail); the section beyond edges an open field on the right. A second junction comes 1.1 miles in, just past a somewhat oddly-placed channel of standing water and a relatively modern shed. Here the Culler’s and River Trails briefly come together; after 50-100 yards, however, they split again. Stay left on the River Trail. The next mile is one of the nicest in the park, with two access point to the water. 6.3 miles into the hike, the River Trail ends and turns into the 1-mile Bluebell Trail. 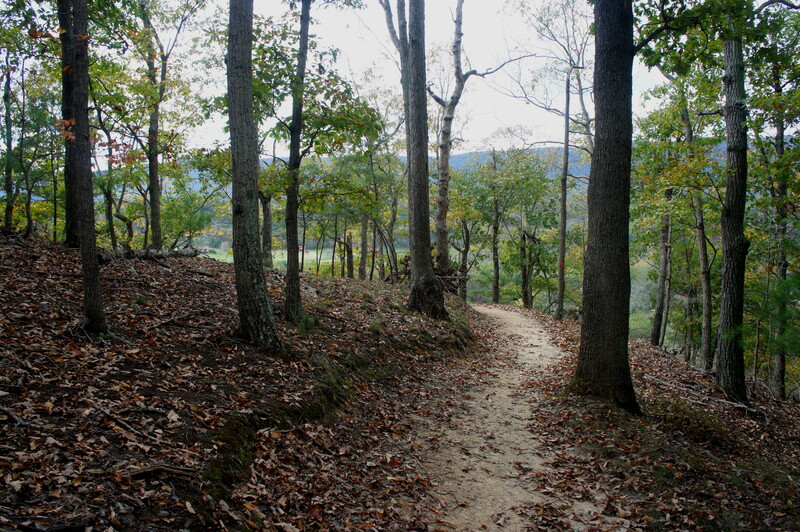 This path for the most part follows a tributary of the Shenandoah and is one of the more popular in the park. Just before the end of the Bluebell Trail (it ends at a picnic area near the northern reaches of the park), bear right onto the green Hemlock Hollow Trail. Hemlock Hollow offers the biggest challenge of the circuit due to its steep ascent of around 100-150 feet in the course of less than a quarter mile. 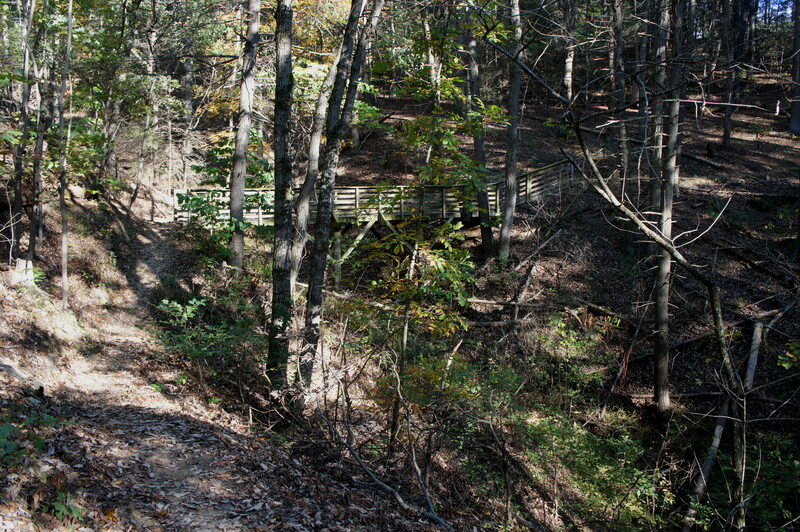 After the initial climb, the trail levels off and winds around the namesake hollow, where two wooden causeways have been constructed to cross a pair of ditches. By now the Visitor Center is in sight, and a short uphill leads back to the start. Allot between 3-5 hours for the round-trip hike, depending on pace and physical ability. It’s not a particularly difficult trek, but 7.8 miles can feel long, and—despite excellent markings—route-finding amidst the maze of trails can be hard for some. 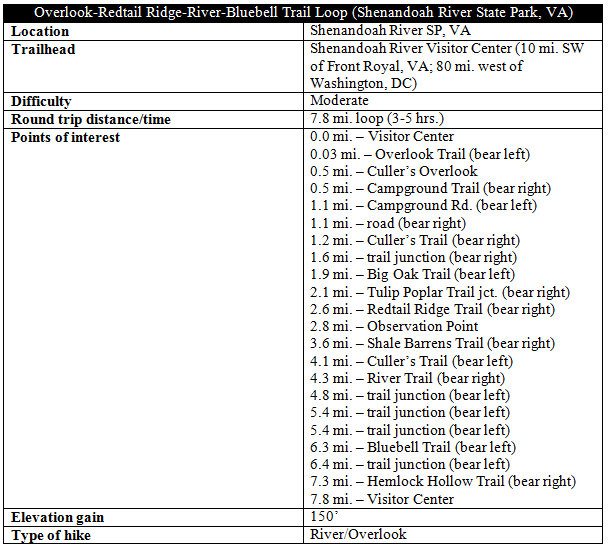 This entry was posted in Moderate Hikes, Shenandoah River State Park, Virginia and tagged Big Oak Trail, Bluebell Trail, Campground Trail, Culler's Overlook, Culler's Trail, Hemlock Hollow Trail, loop hike, Observation Point, Overlook Trail, Redtail Ridge Trail, River Trail, Shale Barrens Trail, Shenandoah River, Shenandoah River State Park, Virginia. Bookmark the permalink.